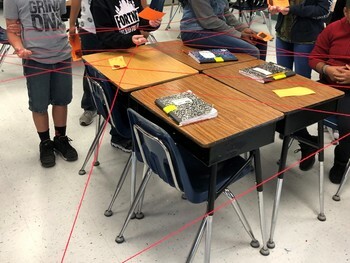 Target learning: Understanding the flow of energy between organisms in the food web and food chain. 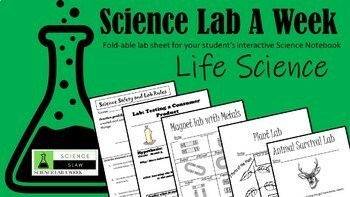 · This lab comes with a fold-able lab sheet that can be easily glued into your student’s science spiral or Journal. I have included two lab sheets on different levels. The lab sheet on the higher level will address the energy pyramid and 10% rule. Students will also create a food web with 12 different plant and animals. They will cut and glue the food web in their spiral and draw arrows. 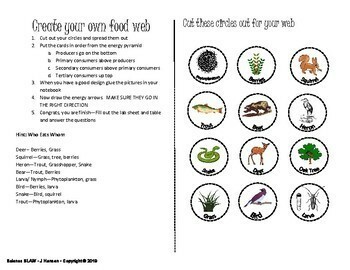 · Plant and animal cards to create a human food chain with yarn. 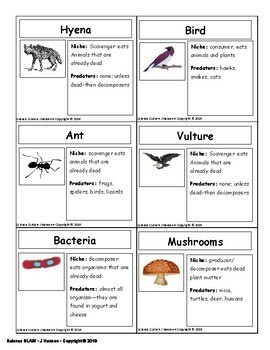 You can have them make it as a whole class or have groups line the cards up at their desks. Lots of great discussion will come from learning more about how this organisms interact in their environment.